Situated in the heart of the Cascades shopping centre in Pietermaritzburg, Coffeeberry Café is an upmarket coffee shop and pancake bar that has enjoyed much success since its inception a number of years ago. The café pays tribute to the humble coffee berry by serving world-class coffee and award-winning cappuccinos to its patrons. In addition, the eatery offers an extensive breakfast, lunch time and snack-time menu. 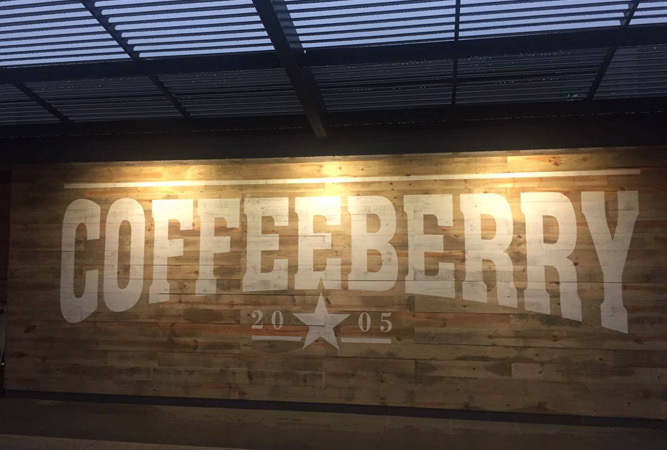 The Coffeeberry concept revolves around the natural, healthy side of coffee; the actual origin of this much loved commodity. It is widely accepted that a young goat herder named Kaldi discovered the little red berry more than a 1,000 years ago – a discovery that literally changed the world we live in today with coffee, after petroleum, being the most heavily traded commodity on the planet. Coffeeberry pays tribute to Kaldi and his discovery through its attractive interior décor where big, bold pictures of coffee plants and berries abound. These beautiful images are cleverly set against a background of stone and other natural textures which create a bright and uplifting atmosphere. It’s a great concept that has worked extremely well for owners Con and Sue Malherbe who have won a number of hospitality awards over the years, clearly a sign of a successful business. The café’s menu offers a wide range of uncomplicated, quality food and drink items at affordable prices and is one of the most comprehensive I have encountered for this type of eatery. Divided into nine sub-categories, the Coffeeberry menu has a variety of breakfasts ranging from the simple light start (R29) option to the comprehensive and hearty Coffee farmer’s breakfast (R69). Lunch offerings include a wide selection of toasted and open sandwiches, tramezzinis, burgers, salads and ‘wholesome meals’ such as grilled chicken strips (R70), Arabica chicken fillet curry (R59) and grilled Atlantic hake (R59). Those with a perennial sweet tooth will be pleased to know that a number of delectable desserts are available, not to mention a host of hot and cold beverages. Children, too, are well catered for in the form of a comprehensive kiddies menu with a varied selection of breakfast, lunch and dessert options such as the Jerry’s breakfast (R29), fun fish fingers (R30) and the cinnamon and sugar pancake with ice-cream (R15). The café also has a pancake bar which forms an integral part of the Coffeeberry concept. The bar is situated in the front of the store where pancakes are prepared in full view of the customer, creating an entertaining inter- action between the customer and the pancake chef. Children, especially, enjoy watching how the pancakes are prepared. In fact, Coffeeberry has become famous for its “Giant Gourmet Pancakes” with various delicious sweet and savoury fillings to choose from. I enjoyed a delicious hot chocolate (R21) while I waited for my order, the vegetarian breakfast (R52), to arrive. Consisting of two eggs, sautéed mushrooms, grilled banana (I declined this item given my dislike for bananas), grilled tomato, potato wedges and toast the vegetarian breakfast was scrumptious and value for money. The quality and presentation of the meal was excellent, clear evidence that it had been expertly and carefully prepared and I didn’t even have to wait that long for it to arrive, all of 20 minutes in fact. Coffeeberry state their intention is to always deliver the highest possible standard of service to their customers and they seem to be delivering on that promise because I was very impressed with the service I received. My waitress was friendly and knowledgeable and Con was most helpful and more than willing to answer any questions I had. The upbeat vibe and buzzing atmosphere were refreshing too –always a sign of a thriving and successful operation. Coffeeberry café is a great place for people from all walks of life to enjoy a healthy and affordable meal in an uplifting and friendly environment. It is an absolute must visit for both locals and ‘Out of Towner’s’ alike. The café is open Mondays to Saturdays from 08h00 to 17h00 and on Sundays from 08h00 to 15h00. Do we need to book if we want to come for lunch on Mother’s Day? All the items on your menu are scrumptious.